Seven STSMs have been awarded for Grant Period 2 (1/5/18-30/4/19). Details of these missions are provided below. Host: Mark Taggart, Environmental Research Institute (ERI), University of the Highlands and the Islands, Caithness, UK. Summary: I will carry out a review of research articles published to date related to the detection and potential effects of veterinary drugs in avian scavengers, including NSAIDs, antibiotics, antiparasitics and barbiturates. This will consider key exposure pathways, not least via the disposal of carrion on land. I will compile existing information regarding product use rates in Europe, typical environmental residues, compound toxicokinetics-toxicodynamics and key toxicity data (where available). I will also consider regulatory issues, risk assessment and avian physiology - as a factor in determining risk in different scavenging species. Lastly, I will create a template for use in recording visceral gout (a key indicator of NSAID related toxicity in certain species) for laboratories to use when undertaking post-mortem examinations. Mission holder: Laura Monclús Anglada, Department of Animal Health and Anatomy, Veterinary Faculty, Autonomous University of Barcelona, Spain. Host: Oliver Krone, Leibniz Institute for Zoo & Wildlife Research, Germany. Summary: I am working on the existing lead monitoring data in raptors, preparing the basis for a peer-reviewed paper. Before starting the literature search, the relevant questions to be answered were defined. I then used three search platforms to look for all relevant papers worldwide, and reviewed these papers to obtain an overview of the topics covered. I constructed a dataset from these papers, extracting key information (country, year, species, sample matrix, concentrations) and transferring this into an excel matrix and an associated file with the entire information summarised and downloaded. Finally, I have drafted key points and structure for the review paper. Summary: The general objective is to perform a literature review concerning the presence, concentrations, and (bio)-analytical methods currently available for emerging and legacy organic contaminants in raptors. In parallel we aim to do some research on the development of analytical methods for emerging contaminants in birds of prey. We aim to publish the outcomes in two scientific articles, which will be finished when I return to my Home Institution, working in close collaboration with the Host group: 1) literature review and meta-analysis of current monitoring activities on a pan-European scale; and 2) analytical optimization of methods for emerging contaminants (i.e. bisphenols and benzophenones) in birds of prey. Summary: The purpose of this STSM was to assess the extent of existing raptor collection in Europe including the content of these collections, ongoing collection activity, available facilities for collection/ storage, current provision for research access to collections and samples exchange, and current constraints to ongoing collection, storage, research access and sample exchange, as well as any existing related contaminant data. This involved design and issue of a questionnaire to natural history museums, environmental specimen banks and other collections across Europe. 113 responses were received and analysed. This STSM provided input for the WG3 meeting in Brussels on 10-11 December 2018. Summary: In order to review raptor ringing across Europe, I am conducting a questionnaire based study, which will be sent to all ringing schemes that are members of EURING (The European Union for Bird Ringing). The questionnaire covers the logistics and protocols of raptor ringing alongside collecting more information about raptor material collection and telemetry data. Additionally, the questionnaire collates raptor ringing data between 2012-2018 which, I will analyse for individual schemes, species and also the EURING network as a whole. In order to gain an in-depth insight into raptor ringing as well as find areas that could be improved. Summary: Monitoring contaminants Europe-wide is a great challenge that requires several constraints to be solved. The aim of this STSM is to identify and search for solutions to the main limitations to obtaining and sharing raptor samples, and related contextual data about the individual and/or population from which samples are obtained. 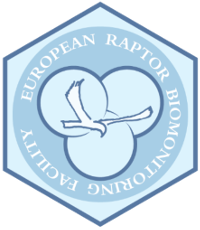 To achieve our proposal, we are collecting information from different actors involved in the European Raptor Biomonitoring Facility. Constraints differ between countries, especially those related to differences in national legislation, country geography and abundance and distribution of focal raptor species. The data collected in this STSM will contribute to more effective and comprehensive pan-European biomonitoring schemes using raptors. Summary: The focus of my STSM is to collect information about Peregrines and other falcons in European cities. I aim to give a literature overview on Peregrine Falcon studies, sum up existing protocols and contribute to the development of best practice guidance for sample and contextual data collection. Consolidating the mission, I aim to collect information regarding urban breeding sites, population development and people that can contribute to the knowledge. Therefore I am developing a database of urban peregrines websites with webcams and contacts of groups. By means of a questionnaire survey, I want to enquire their willingness and ability to participate, share data and best practice, as well as contribute to sampling.